How soon is too soon to travel with a new partner on a self drive. Auto Rental Uganda | Uganda Car Rental and Self Drive AdventureUncategorizedHow soon is too soon to travel with a new partner on a self drive. “I love you” OR “fancy a holiday?” The three scariest words to utter during the first stages of a relationship,It’s a tricky one. 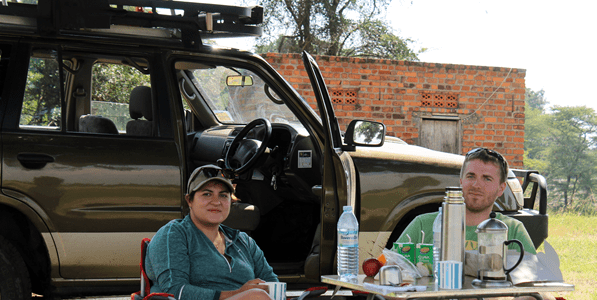 Taking a self drive safari in uganda with someone you don’t know very well – be that a new best friend, colleague or a new partner is for sure a turf familiarization process. you for sure do not know how all will go and how it will end ant the end of a long awaited safari on your side more so to a developing country like uganda where everything is really trying ant trust. And if you have made this decision and yes you want to do it with your other half soon, what does your choice in destination say about the stage of your relationship, if anything?In a quest for answers, or at least clues, as to when, where and whys of how soon is too soon?Or how long is a piece of string, you might say. Every situation is different of course,If you’ve been going out for a month, have one night away. Two months, two nights away – or a weekend – and so on, so that by the time you’ve reached the seven-month mark, that’s time to take a whole week or two weeks away in uganda for a self drive safari with the budget rav4s or the luxury 4WDs away together. Taking a self drive safari in uganda early on in a relationship is a time-saver and a partner-sifter. It unlifts the mask of politeness and forced charm,this gives you time to learn the new lover you have in case your flight gets cancelled or your hotel is overbooked, the car rental company cannot take a credit card and they need cash that may be you do not have on your account. It’s a priceless look into your future together. Renting a car in Uganda comes with flat tires, co signal on the mobile phones to communicate with the car rental company, the complete break down of the car and may be walking for miles for help, damaged camping equipment, unpredictable rains and much more, all these gives life to a new relation ship learning to work together and this will open a door of will you marry me or this this ends here in uganda. I wrote this article after talking to a couple at the end of their self-drive safari in uganda told me how they are new in their relationship ans according to what they went through on the safari they discovered they are better off being husband and wife than boyfriend and girlfriends. what do you think taking up that safari in uganda on a self drive with you and your partner to test what is out of the box.